Wowza. 2016 was a doozie, wasn't it? Just like the current events, I have to say that 2016 wasn't the best year I've ever seen. But some pretty awesome stuff did happen. Let's take a look down memory lane, shall we? I was in my cousin's wedding in Sarasota, Florida. We road tripped down on January 1st and stopped in Savannah and Charleston. We saw an amazing sunset, I got bit by a thousand fire ants, and we hiked a beach, among many other things. I started doing Blogilates and I felt amazing. I officially changed my name! YAY! I started my final year of college, and began interning in a 4th grade classroom. We celebrated Macy's birthday with a surprise-ish party at Megan's apartment and The Rockwell. We tried to do our best to gracefully navigate the waters of unemployment as I went to school full time and Brandon searched for a job full time. This was not one of the fun parts. We hiked a lot to take our minds off of life. We even hiked part of the Appalachain Trail. We became really interested in health and nutrition. We watched Forks Over Knives and decided to try to make some lifestyle changes. I got my wisdom teeth out. And they were infected so I was on intense pain killers for a week. And then went through withdrawal from them. So that was a super fun spring break. But here's a video that I apparently made while on medication. Cue the crying laughing emoji. We visited my dad's childhood home in Bolton Hill. He lived in a 5 level brownstone town house...and it was GORGEOUS. It was amazing hearing the stories. We went to Light City 2016 in Baltimore. It was super awesome-- I just wish the weather had been better. It was so cool to see so many people come together downtown to explore. Two words.... BASEBALL. SEASON. We went to Opening Week at Camden Yards, and while we didn't have season tickets like we did last season, we were able to make it to quite a few games this month. The Blogger Babes took a trip to the Big Apple...and it was pretty incredible. I completed the first part of my teaching certification...and passed...YAY! Prayers were answers...Brandon started his new job! I switched over to Squarespace and loved it! We celebrated one year of marriage...I can't believe it's been a year already! We spent our anniversary night at one of our favorite restaurants in Baltimore-- Woodberry Kitchen. Then, we visited the place where we got engaged. Heart eyes. Mandi from Chesapeake Charm Photography took amazing anniversary photos for us. 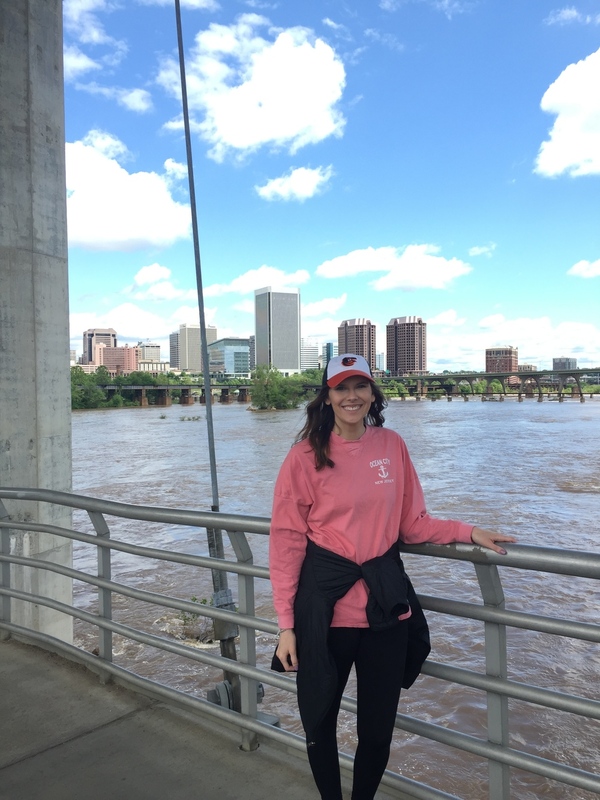 We spontaneously went to Richmond, Virginia for a weekend and fell in love with the city. I finished my semester. Only one more to go! We went to the Charm City Clue Room to try to escape and man... did we laugh! We went to Berkeley Springs, West Virginia and had more fun that expected. We went on a wine tour of Maryland with friends...and it was a BLAST! We road tripped to Cleveland, Ohio to see the Indians play...and then we made a quick trip to Detroit, Michigan to see the Tigers play! It was a whirlwind weekend...but nonetheless, fun! I was in my friend, Kate's, wedding. It was on a hot, summer morning and we partied all day! I fell in love with the idea of minimalism. We de-cluttered physically and emotionally. I started my final semester of college, in a first grade classroom! We saw our favorite comedian in Washington D.C. spontaneously! I taught. A LOT. I worked on teaching certifications. A LOT. We went to Providence, Rhode Island and Boston, Massachusetts for a quick weekend trip to see the Boston Red Sox play. It was kinda a sucky weekend, but hey, you live and you learn! We went to Hershey Park with my brother, sister-in-law, cousin and her husband and Brandon. It was a blast....but very, very, very cold. I submitted and found out that I passed my teaching certification! We had a great Thanksgiving with family at home. We watched Gilmore Girls: A Year in the Life and wow. Just wow. We decorated for Christmas. Yes, we're the early Christmas decorater people. I GRADUATED COLLEGE. Cue all the tears. And my family surprised me with a trip to Disney World as a present. Because they're the best. We celebrated the coming of Christmas in the most Baltimorean ways we could by going to the Washington Monument lighting and 34th Street. Macy hosted an amazing Friendsmas dinner for us that made me feel so loved and blessed. We toured Hampton Mansion with my parents and their cousins. I loved seeing the mansion all decorated for Christmas, and Brandon loved all the history. We had a quiet Christmas Day at home, surrounded by a hodgepodge of people who make life good. What was the BEST memory you have from this year? Tell me in the comments below!